Blac Chyna attends the BET Hip Hop Awards 2017 at The Fillmore Miami Beach on October 6, 2017 in Miami Beach, Florida. Not like this, Blac Chyna. Not like this. We try not to spontaneously write off everyone with a Kardashian family affiliation, if only because that circle gets larger by the day—and because Kardashians are people, too (or so we hear). 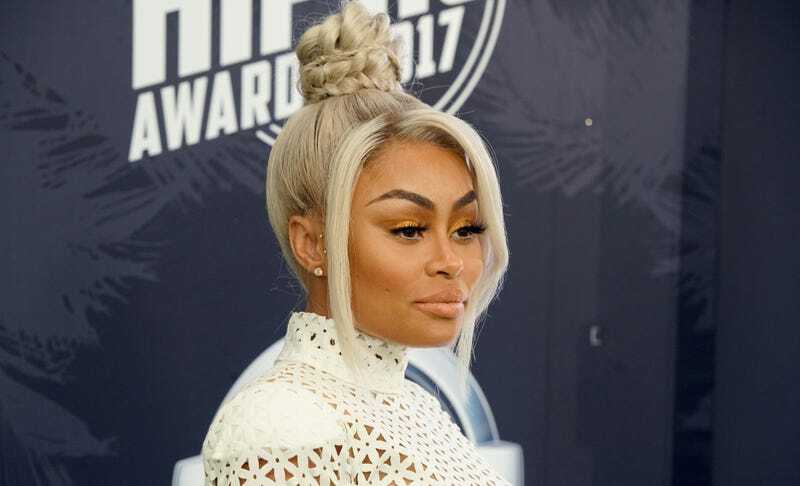 But the former Kardashian in-law (and current co-parent) known as Blac Chyna clearly shares the family’s penchant for notoriety-stretching endorsements and shameless self-promotion, since she’s now aligned her self with infamous skin-lightening brand Whitenicious by Dencia. Founded by Cameroonian pop star Dencia, Whitenicious raised major controversy when it debuted in 2014, touting itself as a “fast acting, 7-day dark spot remover,” with before-and-afters of its formerly milk chocolate-hued founder turned a milky skin tone. Similarly, Whitenicious x Blac Chyna Diamond Illuminating & Lightening Cream, which is thus far being launched and promoted exclusively in Africa, suggests “looking at the bright side of our faces,” with several Instagram posts featuring the media personality and mother of two preening with a Swarovski-encrusted jar of cream, and appearing slightly paler than her already light-skinned self. The product’s homepage claims the product “brightens [and] lightens without bleaching skin out”—and as TMZ reported, a rep for Blac Chyna said that “she’s been using Whitenicious’ corrector for a few years to deal with her hyperpigmentation.” But the affiliation has understandably raised the ire of social media; so much so that comments have been disabled on all promotional posts on Instagram. But of course, that didn’t stop Black Twitter from going in on what many viewed as a hypocritical partnership—and one contributing dangerously to the skin-lightening epidemic and colorism in many parts of Africa and beyond. (Fun fact: Chyna will be in Lagos, Nigeria this Sunday to launch her $250 per jar product) At least one even suggested that Blac Chyna now revert to her birth name, Angela White. We are all for black women being entrepreneurs and making coin—especially a single mom whose child support is currently in dispute. We were all rooting for you, Chyna. But this ain’t it, sis. Correction: Nov. 20, 2018, 6:27 p.m., EDT: An earlier version of this post mistakenly identified singer Dencia as Nigerian. She is, in fact, Cameroonian.